Climbing into the BMW M3 and BMW M4, drivers will be greeted by the interior architecture familiar from the BMW 3 Series and BMW 4 Series, a driver-oriented setup wit even sportier accents. In keeping with the character of the two models, however, the interior fulfills an even more sharply defined sporting brief. BMW M equipment details includes M door sill finishers, an M driver’s footrest, M gearshift lever, M-design circular instruments with white graphics, M leather steering wheel with chrome trim, color contrast stitching and electroplated- look shift paddles (if the M DCT gearbox is specified). Flawless ergonomics for race tracks and streets. New developed M sports seats.Construction of the seats is very flat. Bucket seat with a full-size single-piece back panel and width-adjustable side bolsters. Illuminated for the first time: M logo on the seat backrests. M door sill finisher and M driver’s footrest. Optional electric seat adjustment. M leather steering wheel with chrome trim, colour contrast stitching and electroplated-look shift paddles (if the M DCT gearbox is specified). M-design circular instruments with white graphics. A wide variety of driver assistance systems and mobility services introduced under the BMW ConnectedDrive banner is available as an option. Keen track drivers will be pleased to hear that BMW M GmbH has developed a free BMW M Laptimer app, which allows owners to analyse their personal driving style. 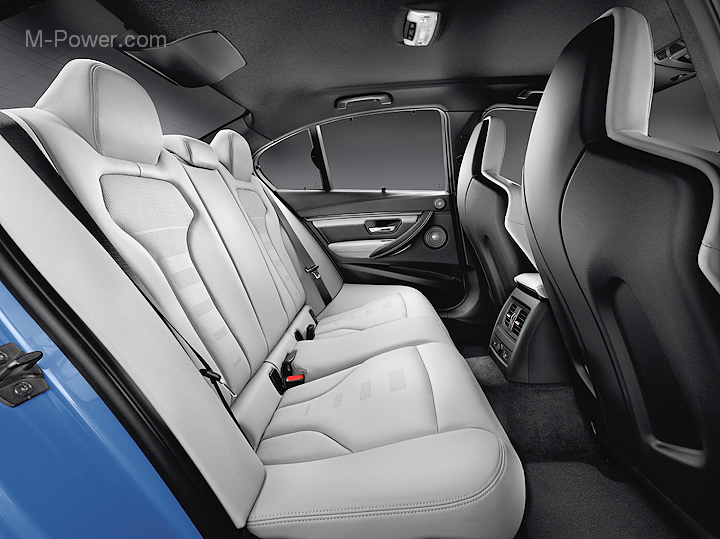 In the rear, too: flawless ergonomics in a sporting ambience.